That is how Norwegians like to think of themselves—as good custodians of the environment, who are helping to move the planet towards a greener future. And so they are in many respects: 98-99% of Norway’s electricity comes from hydroelectric plants. It was one of the first countries to adopt a carbon tax in an attempt to slow global warming, back in 1991. It was also the first country to capture carbon dioxide and store it underground. Making that process easier and cheaper is Norway’s “Apollo mission”, says the prime minister, Jens Stoltenberg. His centre-left coalition government has pledged to make the country carbon neutral by 2030, bringing forward its previous deadline of 2050. Meanwhile, Norway promises to be a “driving force” for a new international treaty on climate change to replace the Kyoto protocol, which expires in 2012. Yet for all its environmental piety, Norway is also a prodigious polluter. Its greenhouse-gas emissions have grown 15% since it adopted the carbon tax. They are still rising, and are likely to continue to do so until 2012, according to Mr Stoltenberg. As it is, Norway spews out more emissions per head than many other countries in Europe. And, in the eyes of many environmentalists, these statistics understate the damage Norway is doing to the atmosphere. It is the world’s third-biggest exporter of gas and fourth-biggest exporter of oil. 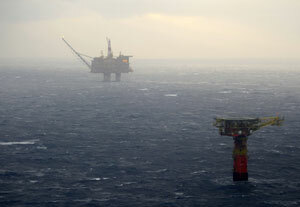 The process of extracting these fuels from below the North Sea releases some greenhouse gases within Norway itself. But when the oil and gas Norway exports are burned abroad, they generate far more emissions. When the government says Norway will be carbon neutral by 2030, it is taking only domestic emissions into account, not the much larger amount embedded in its hydrocarbon exports. By contrast, it does intend to count emissions cuts it has paid for overseas towards the goal of carbon neutrality. Those offsets will be paid for in part with revenue from oil and gas. In short, Norway is profiting handsomely at the planet’s expense, while spending a small share of the proceeds on projects to reverse a fraction of the damage done. All this is the subject of far-reaching political debate in Norway. Some think the country should be doing much more to fight global warming. There are calls to limit new exploration for oil and gas, and so to reduce hydrocarbon exports. Mr Stoltenberg says his government has no intention of doing that. In fact, it is opening up new areas to exploration and development. But that is not enough for Norway’s biggest opposition group, the populist Progress Party: it thinks that the government should spend less time and money on symbolic green goals, and should cut petrol taxes and build more roads instead. All this may sound like a small squall in a narrow fjord. But as more and more countries aim for ambitious emissions targets, they are likely to face similar conundrums. How green is enough? How much carbon is too much? At what point do offsets become a cop-out? As Norway’s experience shows—it was also the first country to see a government collapse amid a row about global warming, in 2000—there are no easy answers to these questions. It is hard to overstate the extent to which greenery has penetrated official thinking in Norway. Successive governments have taken all the obvious steps. There are high taxes on petrol and cars. There is an extensive public-transport system, with trains between the big cities, ferries along the coast and buses that call at many of Norway’s remote hamlets. There are cycle routes galore, and not as many new roads as drivers would like. In fact, the government is so keen to reduce road traffic that it has said it will double funding for public transport for cities that promise to squeeze private vehicles off the roads. Even though nearly all Norway’s power comes from hydroelectric plants, the government is also trying to promote other forms of renewable energy and energy efficiency. It has tightened energy-efficiency standards for buildings. It is encouraging firms and homeowners to burn wood and other forms of biomass for heat and power, instead of fossil fuels. It has set up a fund of 10 billion kroner ($1.4 billion) to invest in renewable-power and energy-efficiency projects; Mr Stoltenberg said last year that he would double the money on offer this year. The government has also set up another, similar outfit to try to advance carbon capture and storage. A third agency, due to start work some time this year, will look for ways to reduce emissions from transport. 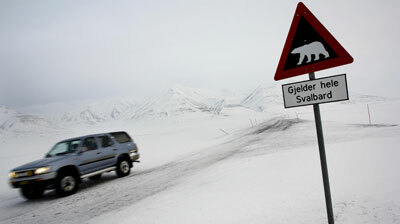 Norway’s bureaucrats spend a lot of time pondering thorny climate-related questions. The Highway Department, for example, has looked into the relative environmental merits of different sorts of fjord-crossings. Bridges, it turns out, are superior to tunnels, since vehicles consume less petrol driving across them than they do descending the steep gradients into tunnels and climbing back out on the other side. What is more, tunnels need power for lights and ventilation fans, and to run pumps when they flood, whereas bridges require almost none. So it is now official policy to prefer bridges to tunnels. The reverse is true when crossing mountains: the extra emissions associated with digging a tunnel are quickly offset by the petrol saved by the cars whizzing through them, instead of winding their way up and down the steep slopes above. Norway boasts the world’s longest road tunnel: a 25km (16-mile) tube punctuated by the occasional blue-lit cavern, to give weary drivers the impression that they are emerging from the gloom, if only fleetingly. State-owned firms have also been drafted into the quest to reduce Norway’s emissions. Statkraft, Norway’s biggest power company, which is entirely state-owned, has several different renewable-power projects under way. It hopes to develop a floating wind turbine, which it believes would be cheaper to build and install than current offshore models, embedded in the sea floor. That would also allow turbines to be used in deep waters in the open ocean, where the wind is often stronger and steadier. But Statkraft’s most ambitious project involves an exotic new technology called salt power. This involves tapping both freshwater and seawater at the mouths of Norway’s many rivers and fjords, and diverting it to tanks on either side of a semi-permeable membrane. The freshwater is drawn across the membrane to dilute the saltwater, and so helps to build up pressure on that side of the tank. The pressurised water can then be used to turn a turbine to generate electricity. Statkraft reckons it could eventually provide 10% of Norway’s demand for power in this way. It has spent ten years and 100m kroner developing the technology. It has managed to increase the power it generates per square metre of membrane from less than one watt to three, and hopes eventually to reach five. Late last year it started up a pilot plant on the waterfront south of Oslo. But the power it produces is still far from competitive. StatoilHydro, the partly state-owned firm that is Norway’s biggest oil and gas producer, also has several climate-friendly projects under way. It, too, for example, is developing a floating wind turbine. It plans to install the first full-scale test model towards the end of this year. And it is participating with the government in a scheme to capture and store emissions from a gas-fired power plant—a world first. To encourage more of that sort of thing, the government levies a carbon tax on Norway’s dirtiest industries. Oil and gas firms, the main target, responded as intended, by enormously increasing their efficiency. On average, oil firms emit 7.8kg of carbon dioxide for every barrel they produce in Norway, compared to a global average of 19kg, according to StatoilHydro. It calculates its own emissions at just 7kg a barrel, or 37% of the global average. To trim its emissions, StatoilHydro has greatly reduced the flaring of natural gas. It also runs two of the world’s four big carbon-capture schemes. These involve filtering out the carbon dioxide that is found along with the natural gas from two of its fields, and pumping it back underground at great expense. It is also experimenting with running cables from the mainland to its offshore platforms, to allow them to run off cleaner mains power, rather than small gas-fired generators. But StatoilHydro’s output has grown so much in recent years that its emissions have risen too, despite these advances. So the government is now trying a new tactic: a cap-and-trade scheme. It has set an overall limit on emissions, and has issued a corresponding number of permits to pollute to firms covered by the scheme. Those that exceed their allocation must either cut their emissions or buy spare permits from other participants. In theory, this system is more watertight than a tax, since the overall level of emissions is fixed. But the government has linked its carbon-trading scheme to that of the European Union, giving Norwegian firms access to a much larger pool of spare permits. That will lower the costs of compliance, but it also means that the desired emissions cuts may take place in Spain or Slovakia instead of Norway. The government also allows firms to pay for emissions-reduction schemes in poor countries in lieu of cutting their own emissions. Such offsets are the most controversial part of Norway’s emissions-cutting drive. It is not just firms that use them—the government is the biggest enthusiast. Norway currently emits about 55m tonnes of carbon dioxide equivalent a year, and the government projects that on their current trajectory emissions will reach 59m tonnes by 2020. Yet it has pledged to reduce its emissions to 35m tonnes by then, and to nothing by 2030. It has identified 10m-13m tonnes-worth of cuts that could be made at home at a reasonable cost. But until new technologies, such as carbon capture or electric vehicles, become competitive, Norway’s remaining emissions will not be eliminated—they will simply be offset. The government reckons it can plant enough trees at home to offset 3m tonnes or so. That should allow it to keep its promise to make at least half of the emissions cuts it has scheduled by 2020 at home. But it still means that as much as half of Norway’s notional reduction in emissions will come from overseas. And without big technological advances, Norway will be even more reliant on foreign offsets to fulfil its goal of carbon neutrality. The government says it will buy only the most copper-bottomed of offsets. These should help development in poor countries as well as the atmosphere. They also advance Norway’s goal of securing a replacement to the Kyoto protocol, by giving poor countries more of a stake in the process. Moreover, in addition to Norway’s purchases of offsets, the government has promised to spend 3 billion kroner a year to slow tropical deforestation. If reducing deforestation is as cheap a way to cut emissions as Nicholas Stern and other climate experts think, then that money alone would be sufficient to offset all Norway’s emissions twice over, Mr Stoltenberg points out. The government’s enthusiasm for oil and gas certainly seems at odds with its extreme punctiliousness about the morality of its other investments. The fund in which the Norwegian state stashes unspent revenue from oil and gas has exacting procedures to ensure it does not invest in firms involved in anything nasty, from human-rights abuses to environmental depravity. It sold its shares in Rio Tinto, the world’s second-biggest mining firm, for fear that a mine in which it owns a stake might have caused “severe environmental damage” in Indonesia. The fund also eschews Wal-Mart, a big American retailer, because of its hostility to unions. Yet such scruples seem to go out of the window when it comes to globe-warming oil and gas. Needless to say, Norway is making huge sums from the export of those fuels. The government estimates its 2008 revenue from the petroleum sector at 413 billion kroner. The oil-revenue fund is the second-biggest of its kind in the world, with a value of 2.1 trillion kroner at the end of September. All that money, in Mr Hansson’s view, could be put towards more aggressive pursuit of low-carbon technology. If the government spent more on offshore wind, salt power and the like, he argues, Norway could substitute exports of clean energy for the harmful sort it currently peddles. Its territorial waters are windy enough, he calculates, to generate 10,000 times the country’s own power needs. Mr Hansson also believes that ordinary Norwegians should live greener lives. Norway has the second-highest income per person in the world, over $100,000 in 2008. That has enabled many Norwegians to embrace quite lavish lifestyles, involving frequent overseas trips, second homes, big cars and perhaps a boat or a snowmobile. They are as prodigal with heating, Mr Hansson claims, as Americans are with petrol. He thinks Norwegians should use their oil wealth to tighten their belts in carbon terms, rather than bingeing. Yet if anything, Norwegians are moving away from environmental self-denial. A recent rise in petrol tax, of 0.05 kroner per litre, caused a political storm. Many drivers, especially around congested Oslo, are also incensed by the government’s reluctance to build more roads. And there is a growing sense that the government is tying itself in knots in its efforts to square its green ideals with the grubby reality of Norway’s hydrocarbon wealth. The Progress Party, which has the support of roughly a quarter of the electorate, has seized on these complaints. Ketil Solvik Olsen, its spokesman on the environment, points out lots of inconsistencies in the government’s stance. Why should Norwegian drivers or air passengers pay many times more in carbon taxes than it would cost to offset their emissions? Why is the government spending so much to develop the technology to capture emissions from gas-fired power plants when what the world needs most is carbon-capture at coal-fired plants? Why is Mr Stoltenberg so anxious to stop Norwegians using gas for heating and cooking, and yet happy for Britons to do so? To celebrate the opening of a new gas pipeline to Britain, he even dropped in on an ordinary British customer for a cup of tea heated up with Norwegian gas, Mr Solvik Olsen points out, just the sort of thing the government frowns on in Norway. All in all, Mr Solvik Olsen argues, the government is too ambitious and too hung up on symbolism. He wants less talk of lunar landings, and more analysis of costs and benefits. And he does not think Norwegian industry can be expected to make many more cuts in emissions. It is already very efficient, he points out, so there are few easy improvements to be made. Instead of limiting the use of offsets, the government should be expanding it. So far, the half-dozen other parties in parliament have ignored the Progress Party’s concerns and signed up to the government’s strategy on global warming (indeed these parties prefer not to collaborate with the populist Progress MPs). But Progress is already the second-biggest party in parliament, after the Labour Party, which Mr Stoltenberg leads. Several polls last year even put it ahead of Labour. Mr Stoltenberg himself first came to power in 2000, when parliament rebelled against the previous prime minister’s uncompromising greenery. It is not easy being an environmental pioneer.